A Giant Porokeratosis of Mibelli: Successful treatment with topical 5 percent 5-fluorouracil. Porokeratosis of Mibelli (PM) is a clonal disorder of keratinization. It clinically presents with one or more annular plaques with central atrophy and elevated keratotic borders. With a 7.5 percent risk of malignancy, PM should be treated to prevent transformation into squamous cell carcinoma, Bowen's disease, or basal cell carcinoma. Multiple treatment options are available; however, there is not one universally effective treatment. Here we describe the successful treatment of a giant porokeratosis of Mibelli of the right lower lateral leg of a 32year-old man with topical 5 % 5-fluorouracil.cream only. After follow up of one year, there was no development of recurrence of the lesion. A young man of 32-years came to us with a 12 years history of a hyperkeratotic scaly annular plaque with central atrophy on the lower lateral aspect of the right leg (Figure 1). The lesion gradually grew to its current size of 17/8 cm but was without itching, tenderness, pain, redness or warmth. At the time of examination, multiple small papules and plaques of typical porokeratosis 7- 8 in number were found in asymmetrically on the trunk and extremities. There was no family history of any form of porokeratosis of him. The patient's clinical history and physical examination suggested porokeratosis of Mibelli. A punch biopsy of the plaque was performed. Histopathologic examination demonstrated a mildly acanthotic epidermis with columns of parakeratosis overlying dyskeratotic keratinocytes with absence of an intervening granular layer. 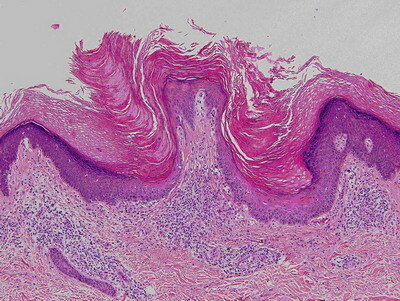 A lichenoid lymphocytic infiltrate was seen in the superficial papillary dermis (Figure 2) . The histopathologic findings were consistent with porokeratosis. The giant plaque porokeratosis on his right ankle was initially treated with topical steroid and cryotherapy but the improvement was not rewarding. The plaque became susceptible to develop infection for which the patient often had to take antibiotic. We decided to treat the patient with topical 5 percent 5-fluorouracil every morning and night for 8 weeks. On follow-up, the annular plaque on the patient's right ankle appeared erythematous and irritated. The patient continued the treatment for 4 additional weeks. On examination, the treated area appeared well healed with mild residual hyper pigmentation after a total period of 12 weeks (Figure 3). All other plaques of porokeratosis healed earlier than the giant form of PM. Fig1. Hyperkeratotic scaly annular plaque with central atrophy on the right leg. Porokeratosis is heterogeneous group of disorders that are inherited in an autosomal -dominant fashion. Usually it is presented as 1 or more atrophic plaques bordered by a hyperkeratotic ridge-like border. There are five clinical variants of porokeratosis: classic porokeratosis of Mibelli, disseminated superficial actinic porokeratosis, porokeratosis palmaris et plantaris disseminata, linear porokeratosis, and punctate porokeratosis . Our patient presented with a giant PM. Classic porokeratosis of Mibelli begins during infancy or childhood as asymptomatic small brown to skin colored papules and plaques with a characteristic annular border  . Porokeratosis of Mibelli classically presents with one or multiple annular plaques with central atrophy and elevated keratotic borders that have a longitudinal furrow .The well-demarcated hyperkeratotic border is usually more than 1 mm in height, with a characteristic longitudinal furrow. The center of the lesion may be hyperpigmented, hypopigmented, depressed, atrophic or anhydrotic..Lesions range in diameter from millimeter to several centimeters, but giant lesions measuring up to 20 cm may occur. Such giant porokeratosis are rare and occurs predominantly on the lower leg and foot. Porokeratosis has also been known to occur on the face, palms and soles, genitalia, and buccal mucosa . If the nail matrix is involved ,nail dystrophy may develop. Lesion may appear during the chemotherapy for malignancy, after the renal transplantation. Histopathologically, PM has the cornoid lamella, a column of parakeratosis arising within the invagination of the epidermis. The granular layer is focally diminished and keratinocytes are dyskeratotic . Porokeratosis of Mibelli has been associated with an increased risk of malignant transformation into squamous-cell carcinoma and Bowen disease, as well as basal-cell carcinoma , with rates as high as 7.5 percent. Large lesions are of a higher malignant potential. As a result, treatment is necessary when PM is diagnosed. Potential therapies include topical 5-fluorouracil, CO2 laser ablation, 585-nm pulsed dye laser radiation, oral retinoids, Grenz ray radiation, Nd:YAG laser radiation, cryotherapy, dermabrasion, surgical excision, electrodesiccation, and imiquimod . A fluorinated pyrimidine, 5-fluorouracil, disrupts DNA synthesis by disrupting thymidine synthesis. This leads to cytotoxic activity towards rapidly dividing cells in the S phase. Because of the hyperproliferative nature of porokeratosis, topical 5-fluorouracil produces an inflammatory response . Both topical as well as systemic 5-fluorouracil has been shown to be efficacious in the treatment of porokeratosis [6,7]. Multiple published case reports of PM treated with 5 percent topical imiquimod have documented its efficacy [8,9,10]. Occlusion of the lesion was an important factor leading to resolution of the lesion. This report describes a patient with PM on the right ankle treated with topical 5 percent 5-fluorouracil, that induced complete resolution. We conclude that treatment with topical 5 percent 5-fluorouracil is another therapeutic option for PM. Further investigation of the efficacy, tolerability, and side effects of 5-fluorouracil in PM is needed. 2. Pizzichetta MA, Canzonieri V, Massone C, Soyer HP. Clinical and dermoscopic features of porokeratosis of Mibelli. Arch Dermatol. 2009;145:91-92. 3. Lin J-H, Hsu MM-L, Sheu H-M, Lee JY-Y. Coexistence of three variants of porokeratosis with multiple squamous cell carcinomas arising from lesions of giant hyperkeratotic porokeratosis. J Eur Acad Dermatol Venereol. 2006;20:621-623. 4. Kanitakis J, Euvrard S, Faure M, Claudy A. Porokeratosis and immunosuppression. Eur J Dermatol. 1998;8:459-465. 5. Alexis AF, Busam K, Myskowski PL. Porokeratosis of Mibelli following bone marrow transplantation. Int J Dermatol. 2006;45:361-365. 6. Nahm WK, Donohue KG, Danahy JF, Badiavas E, Falanga V. Systemic 5-fluorouracil producing an inflammatory response in porokeratosis. J Eur Acad Dermatol Venereol. 2003;17:190-192. 7. McDonald SG, Peterka ES. Porokeratosis (Mibelli): treatment with topical 5-fluorouracil. J Am Acad Dermatol. 1983;8:107-110. 8. Jain S. Successful treatment of porokeratosis of Mibelli with imiquimod 5% cream. Clin Exp Dermatol. 2006;31:302-303. 9. Harrison S, Sinclair R. Porokeratosis of Mibelli: successful treatment with topical 5% imiquimod cream. Australas J Dermatol. 2003;44:281-283. 10. Agarwal S, Berth-Jones J. Porokeratosis of Mibelli: successful treatment with 5% imiquimod cream. Br J Dermatol. 2002;146:338-339. 11. Montes-De-Oca-Sanchez G, Tirado-Sanchez A, Garcia-Ramirez V. Porokeratosis of Mibelli of the axillae: treatment with topical imiquimod. J Dermatolog Treat. 2006;17:319-320. 12. Maubec E, Duvillard P, Margulis A, et al. Common skin cancers in porokeratosis. Br J Dermatol. 2005;152:1389-1391.